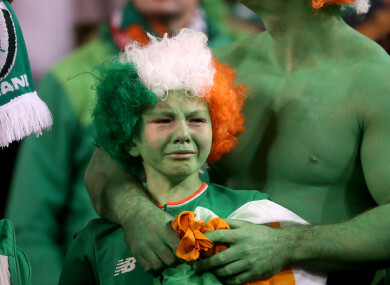 RTÉ HAS SAID that over 1.7 million people tuned in for at least some of the World Cup playoff coverage last night. The huge audience for Denmark’s crushing defeat of the Republic of Ireland was reflected across TV and online, with an average of 1.03 million of us watching the entire game (the other 700,000 people obviously switched off after the fourth goal). A total of 446,000 of watched the pre-match analysis, while 482,000 tuned in for the post-match inquest with Eamon Dunphy, Liam Brady and Didi Hamman. In addition, 135,000 people watched it on the RTÉ Player, making it the most streamed live event of 2017. Of these streams, 57% of them were on mobile devices. The game was also broadcast on a specially-extended sports programme on RTÉ Radio 1. Oh and, sorry if you’ve tried to block it out of your mind already, we lost 5-1. Email “Over 1.7 million of us watched that awful game with the score we don't want to remember last night”. Feedback on “Over 1.7 million of us watched that awful game with the score we don't want to remember last night”.